I know I know.. where have I been, right? Seems like forever since I posted. 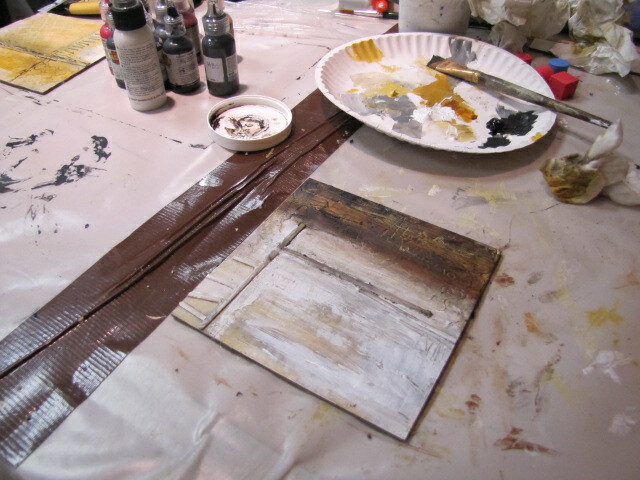 Well, I’m finally trying to sneak back in the studio for some creative time. What took me so long? 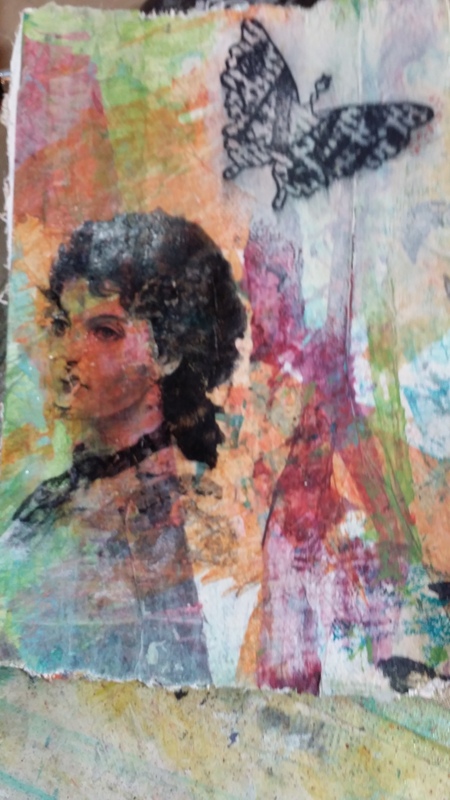 Well, I don’t have excuses, but more like “reasons”… but this blog is all about art, food and fun. No one wants to hear about my full-time job consuming me and just plain being “in a funk” that keeps me away (see how I did that there?) … and Happy New Year to you all. I often wonder how long we need to say that to people. Is it 2 weeks? Let’s say that, shall we? Just backing up a little for some show and tell. 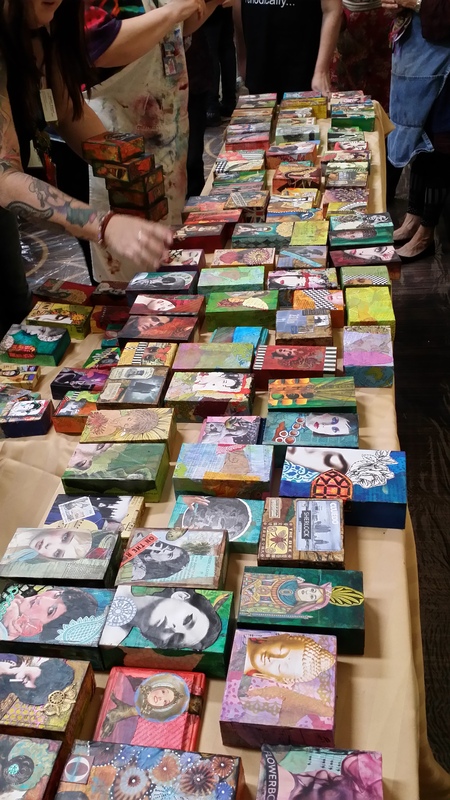 I went to Art is You in Stamford, in October (gosh, was that really 3 months ago?). I took 3 full-day classes. There seemed to be so much energy present this year. Maybe it was because it was my 3rd time attending and I was more comfortable. But, I do know that I was not 100% focused. Was that the beginning of my art funk? I was trying to push through and ignore the feelings. They say, out of sight out of mind. I guess the longer you stay away from art, the more you don’t want to dig in again. I’ve signed up for many on-line classes by some great great teachers. Have I finished one? NO! I start it then I get pulled away. Do art every day..no matter how little. “They” say that, too. So, for 2015, I need to not be so hard on myself and give “me” a break. I’m I alone here? Does this happen to others? How do you push through? 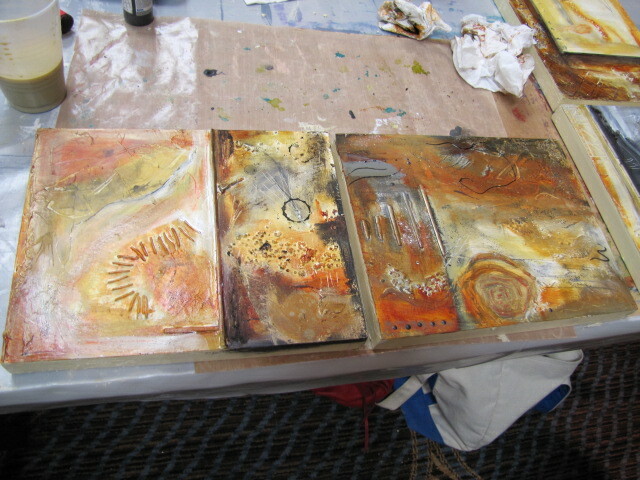 I quickly want to show you the art I created from my favorite class with Andrea Matus deMeng. I so love her work and her style. This was my 3rd class with Andrea and she never disappoints. 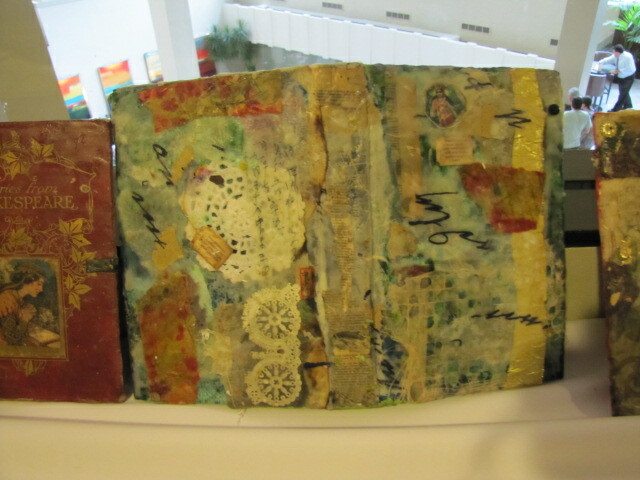 This time, it was collaging on wood blocks. 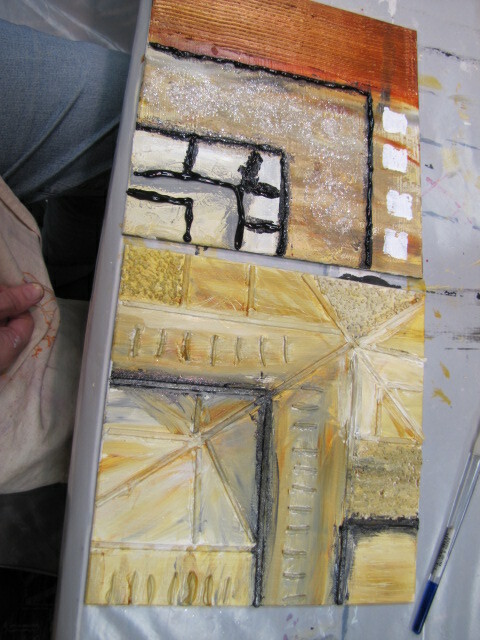 Here’s a peek at my 6 blocks. The bottom left if my mom’s face when she was about 20 years old. I took this class with my side kick, Jessica. 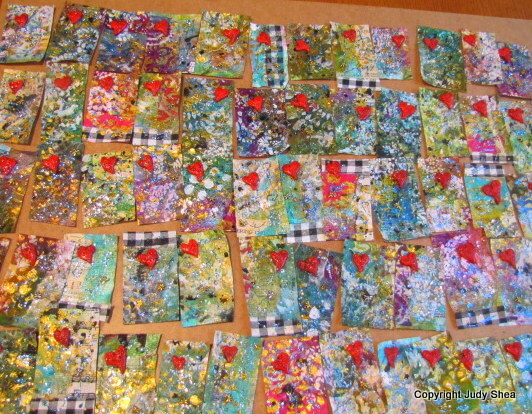 Here is a peek of Jessica’s (left) and all of them together from the class together. Aren’t they just amazing? 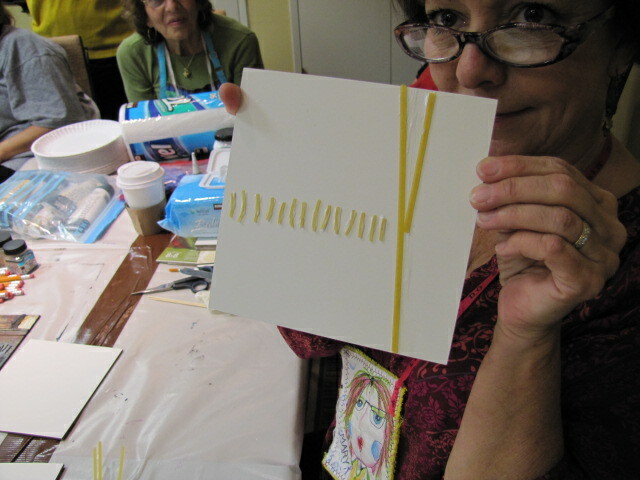 The other class that I took was with Mary Beth Shaw and Pam Carriker. I got a twoferone. 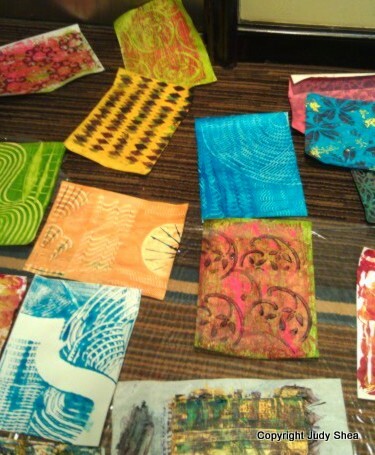 They shared some great techniques and we were able to try screen printing (the bird is screen printed). Here’s what I ended up with. I recently had about 2 weeks off from work for the holidays. Luckily, our company shuts down. What a nice gift. I was able to get a little art in. 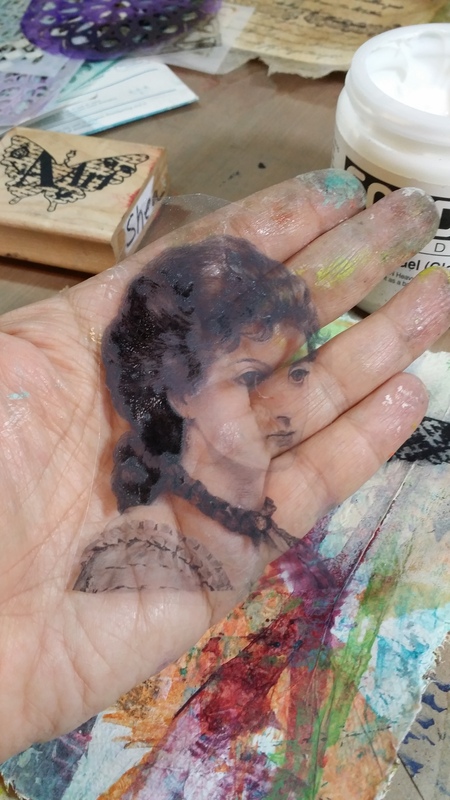 For those that know me well, I love doing image transfers. 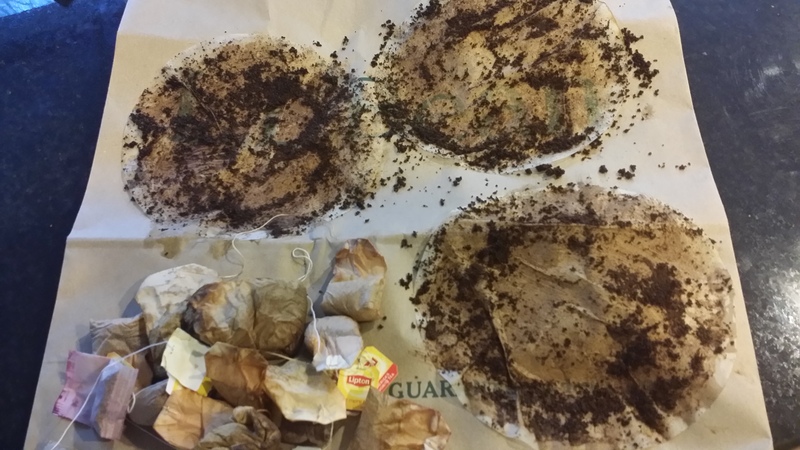 We also drink a lot of coffee and tea in our house and I have been saving the used filters and tea bags. The stain on the filters make a great background for any collages. I have a small bowl where we just dump the used tea bags in. Yup, my family doesn’t question my requests anymore. The fruity teas leave a pretty background. Once the tea bags are dry, cut across the top, dispose of the tea leaves and you are left with this beautiful tea stained filter. Gently open it so it doesn’t rip. For the coffee, lay out the filter with the grinds left and wait for them to dry. Rub off all the dry coffee. 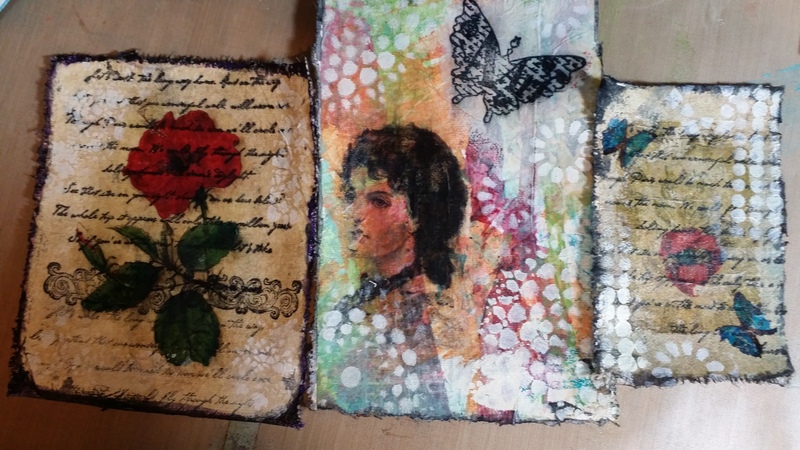 I decided to make some transfers over the tea/coffee filters on raw canvas. 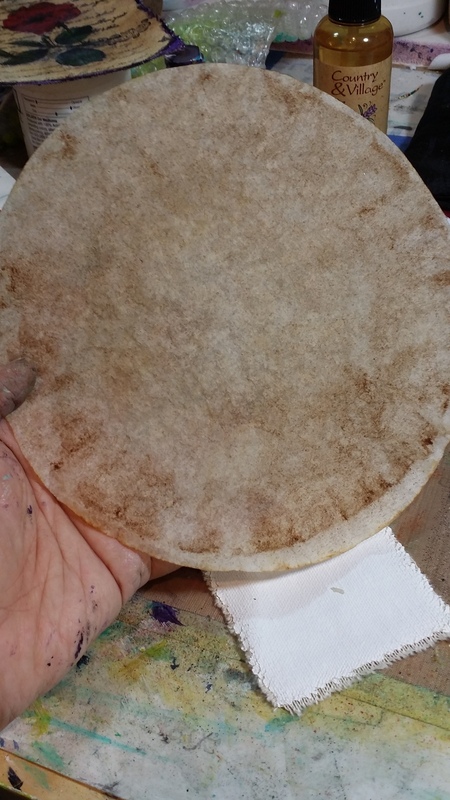 Here is a stained tea and coffee filter. Doesn’t that say vintage to you? I thought so. 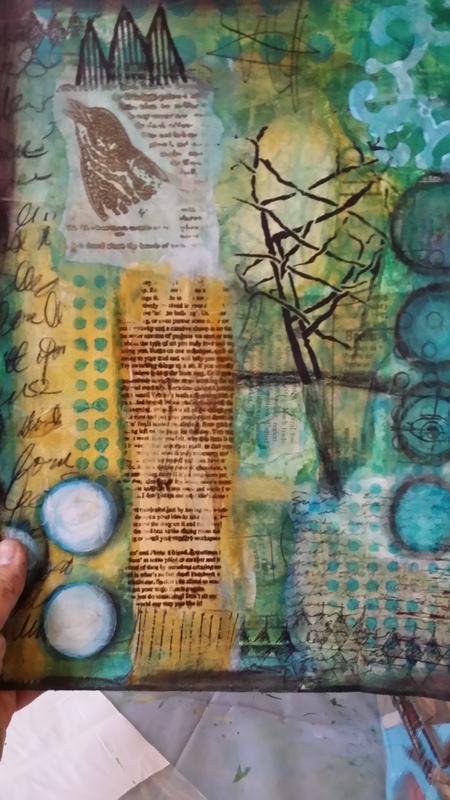 I had some deli paper that I used for wiping left over paint on and I glued that to the canvas using Pam Carriker’s Mixed Media Adhesive. 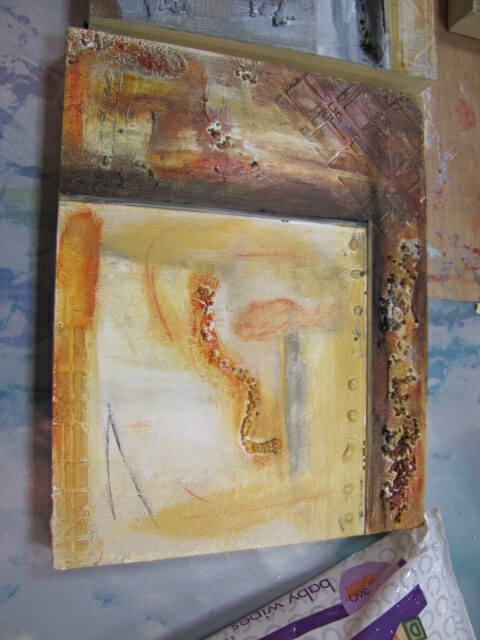 I first gessoed the canvas. Next, I had some images that were printed on transparencies. 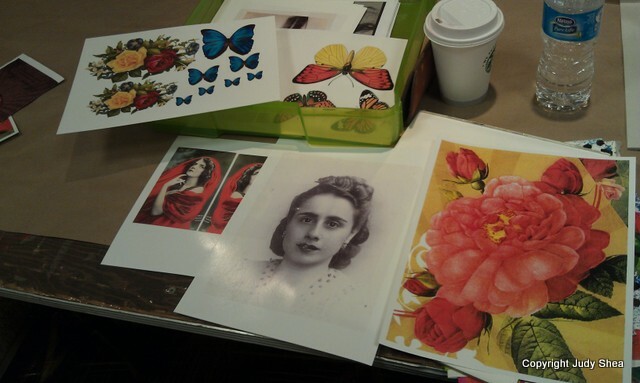 This is one of my favorite ways to do image transfers. Cut out your image after it’s printed on the rough side. Note: I’ve used ink jet prints here. Cut out the image with a border around it for you to grab. 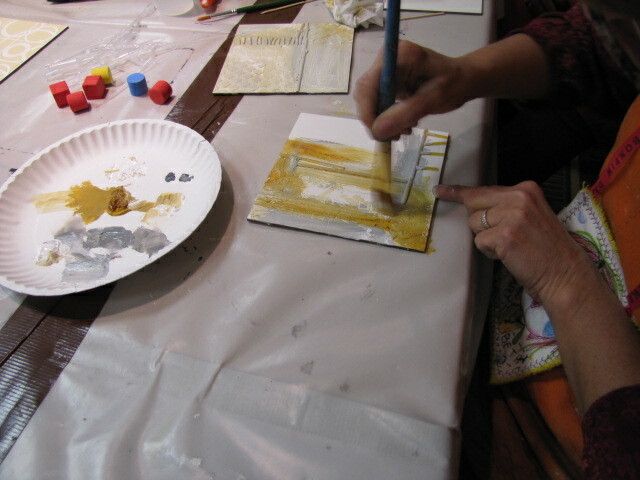 Spread a thin layer of Soft Gel Gloss on the canvas and on the image. Lay it face down and gently rub it in circles with a soft cloth held against your index finger, then wait about 10 minutes. 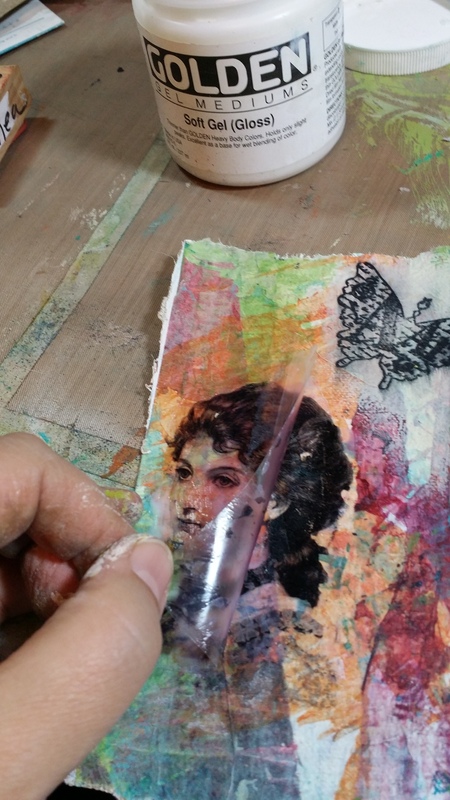 Gently peel off the transparency and you will see the image transfer on to the canvas. Check it from the corner first before you take it completely off. 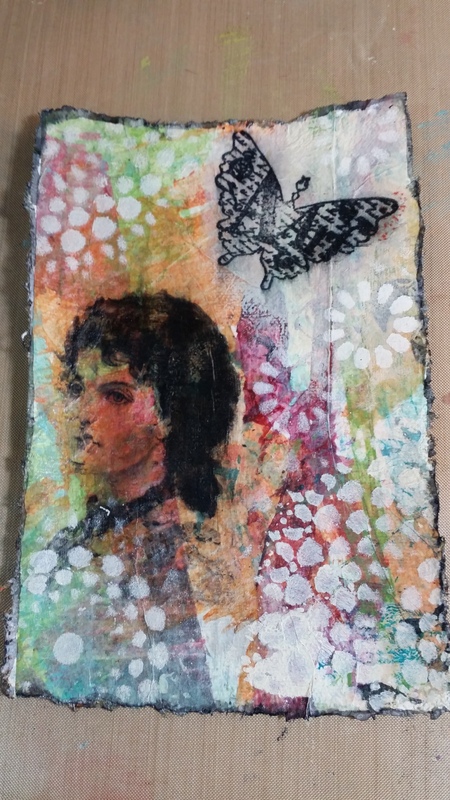 I stamped a butterfly image on deli paper and ripped it around the edges and spread gel medium underneath and on top of the image. The deli paper just melts away and leaves a black, clear image. 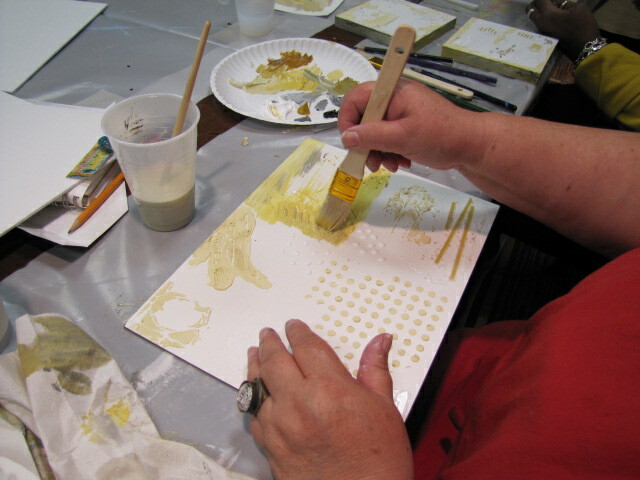 Then I stenciled with white paint. Stained the edges with black distress ink. 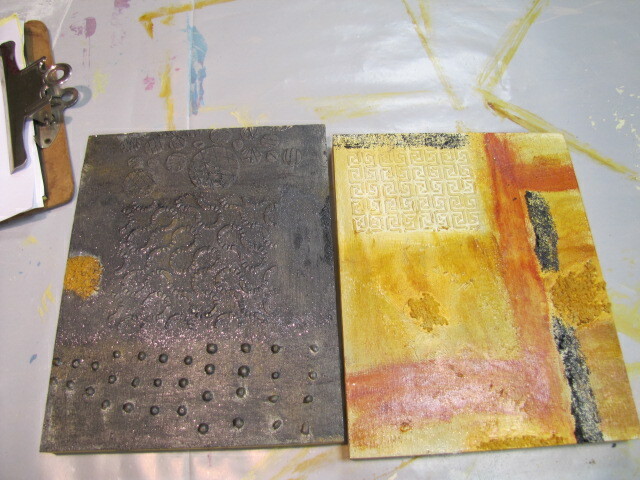 The two end pieces below, is where I used the tea bag filter and coffee filter using the same image transfer method I mentioned above. The little blue butterflies are also transfers. I rubber stamped directly onto the filters. 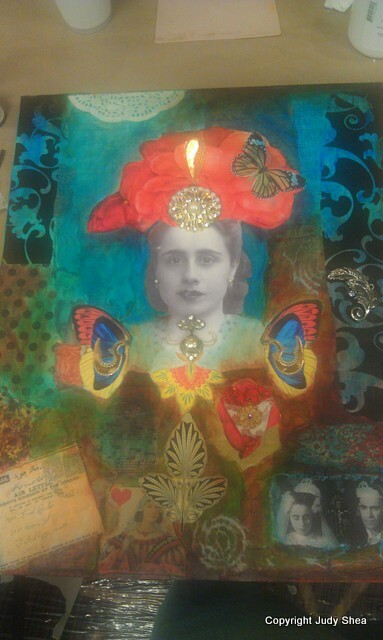 I finally spread Collage Pauge in matte over all of them to cut down on any shine. 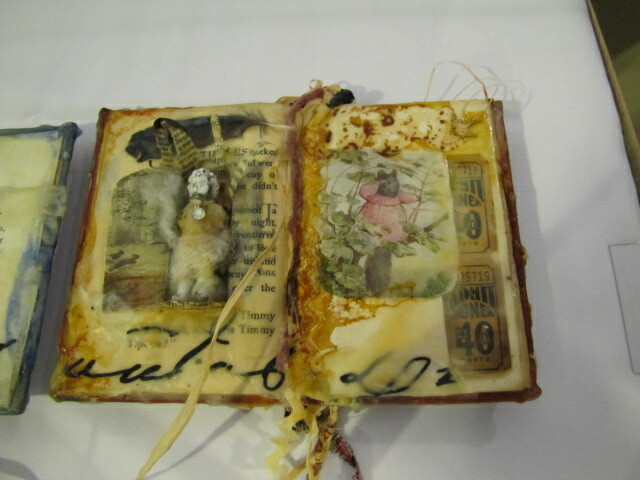 Such a pretty look… like an old book or letter. So.. save your tea bags and coffee filters. Thanks for hanging out with me and being patient. Hopefully, this post has given me a good kick to keep my posts and art going. 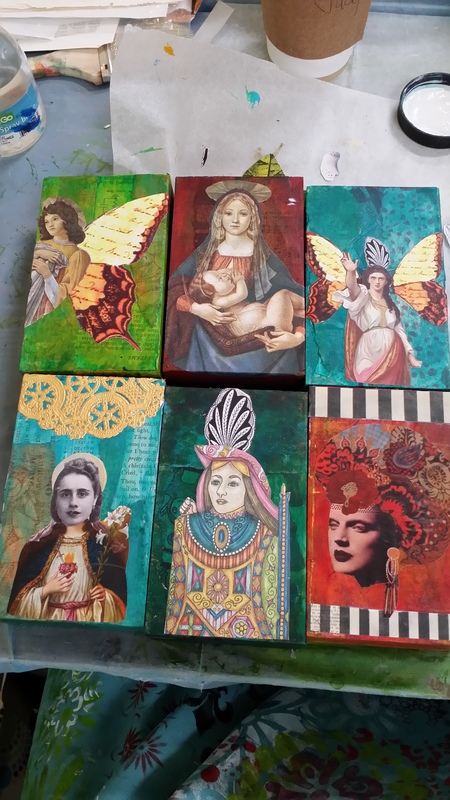 Well, I promised two things… One, that I would give away some of my mixed media fabric collage swaps I made from Tyvek Fabric, see post here, AND.. that I would also give away my Loose Woman Stencil canvas that I did at Art is You last weekend in Stamford. I took a poll on Facebook and asked should I abandon the canvas or give it away. I’m excited that so many of you wanted it. It has a lot of great energy in it. 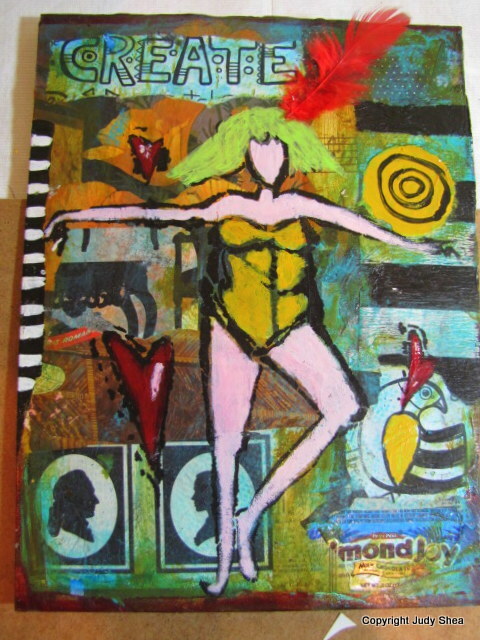 So, the first winner will receive this canvas using the Loose Woman stencil that was designed by Sue Pelletier, one of the designers for StencilGirl. I added some inks and paints to the back and included one of my polymer clay faces I made. 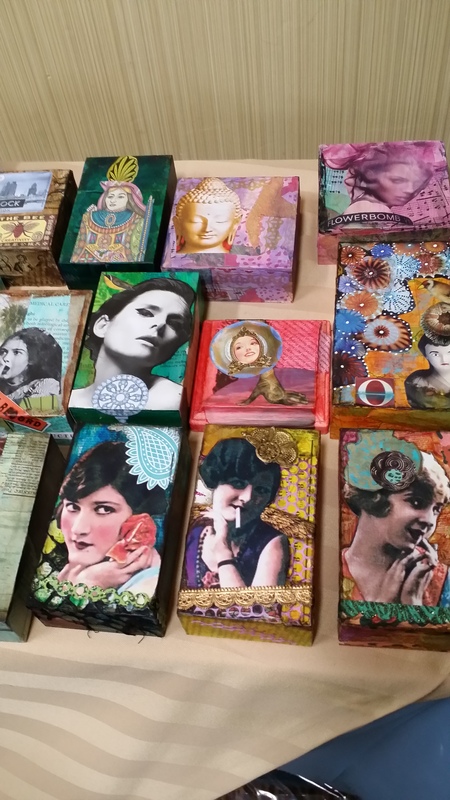 The second winner will receive 5 pieces of my swaps that I made for Art is You. Here they are, below. I’ll be putting this on my Facebook page. Sharing would be most appreciated. Here we go… comment away and I’ll pick two winners this coming weekend. 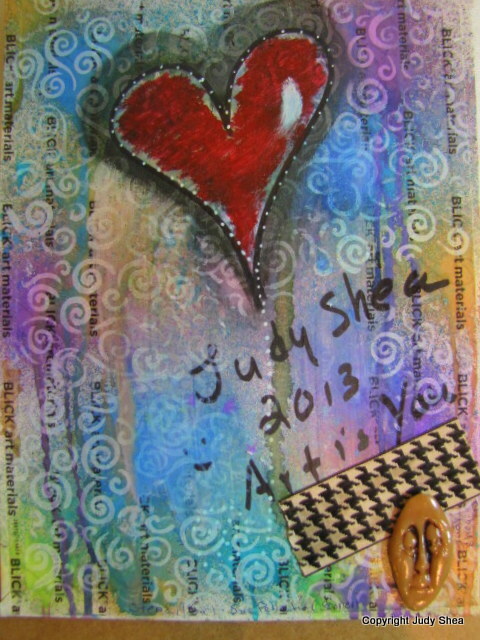 Thanks for stopping by and I love hearing from you and sharing my art. Exciting… fun.. loud.. singing….quiet….happy.. friendly.. exhausting, but in a good way and all well worth it. That is how I describe my long weekend at Art is You in Stamford. My second year attending. 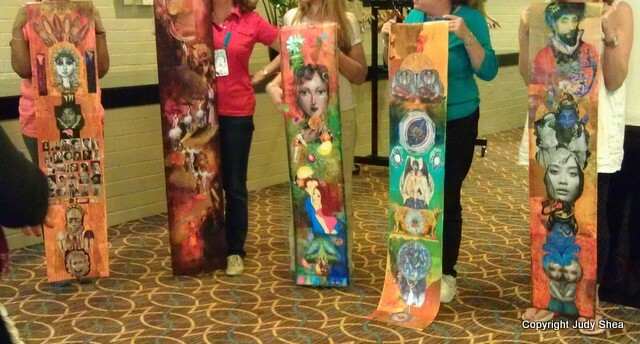 Day 1 for me was a workshop with Albie Smith called Totally Amazing Papers. 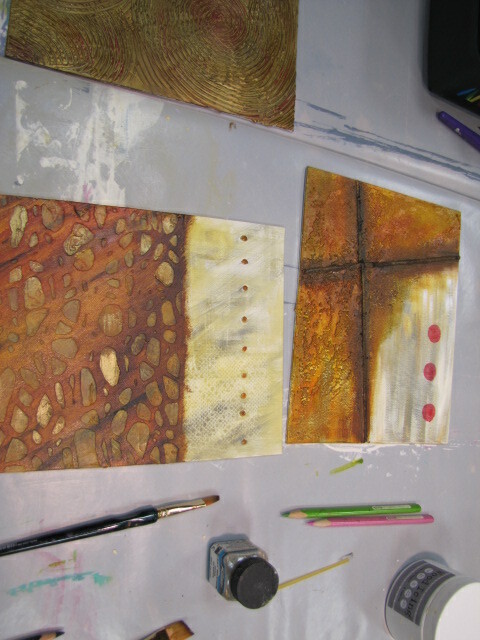 Wow.. messy fun and gorgeous results making our own paints with pastes and marking the papers with our own designs. Thank you, Albie. Check her out . 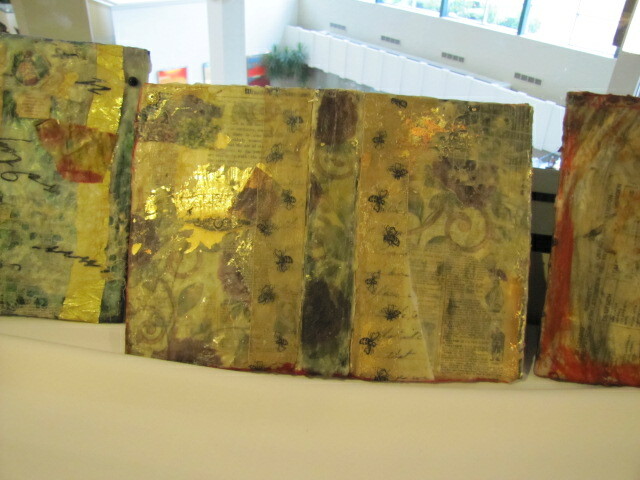 Here are some of the papers I made. I hope you get the idea of what you can create. Not to mention how much cheaper making your own paints are compared to using straight out of the bottle. Mucho cheaper. Days 2 and 3.. we worked so hard. Our teacher was Andrea Matus DeMeng. She told us she was going to work us and that she did. 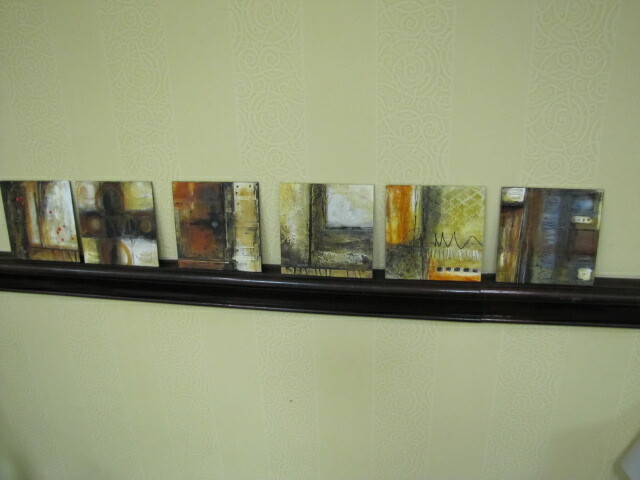 She also promised us that we would walk away with beautiful art.. and that, my friends, we did. 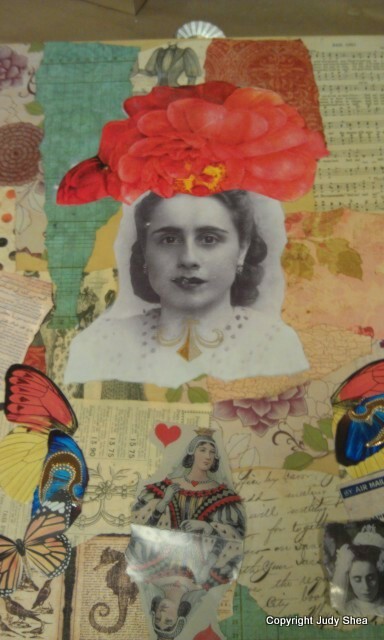 It took me about a week to find images that were copyright free to use in our collages. Whew.. what a task, but now I have enough to last me. Many of my images came from old country family photos. See, what I wanted to do on the first day was to create a story of my parents. Read on. 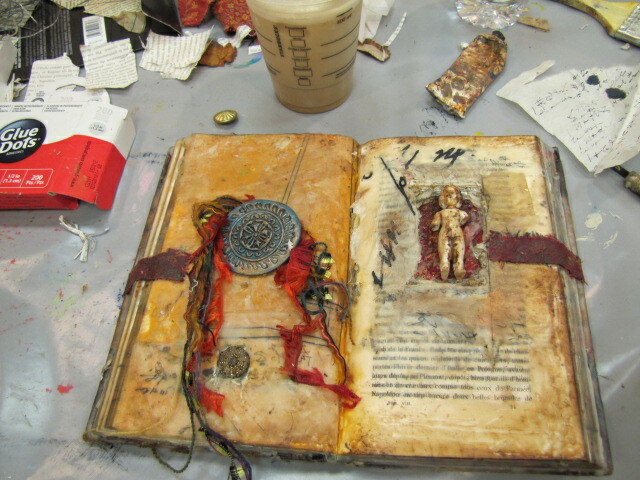 The first day with Andrea was Mixed Media Mythologies. I used a cradle board to create a story of my parent’s life. How my father went back to Syria to find a wife (yup, it’s true). Chose her going door to door.. (yup, true again). Anyway.. long and great story. 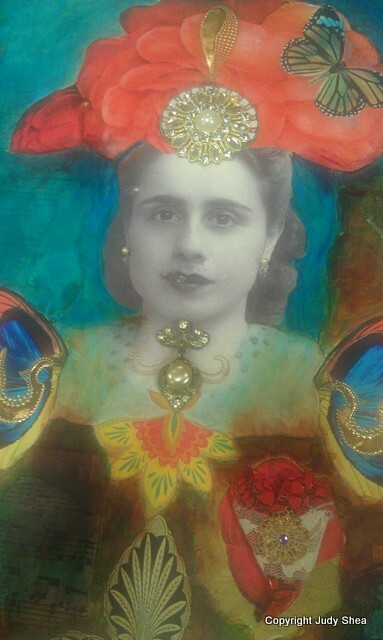 My focal point was my mom’s photo in her twenties. I love this picture of her. 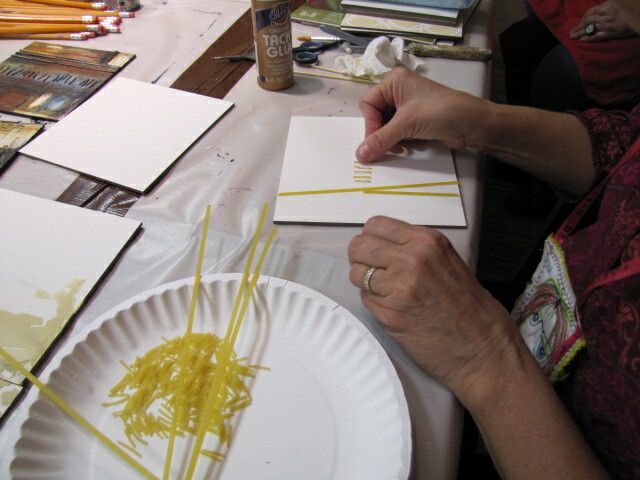 Here is a picture of gathering materials for the collage; then how it evolved. Day 2 with Andrea was Marquis de Scroll. Are you kidding me? 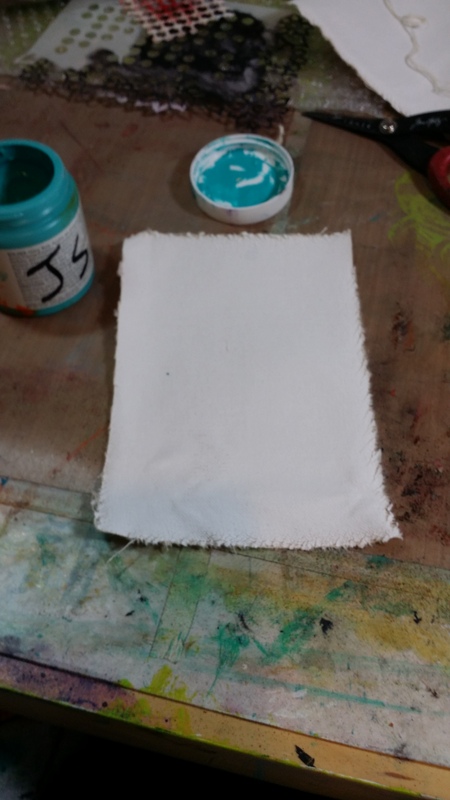 Work on a 5 foot piece of canvas? I’m there. 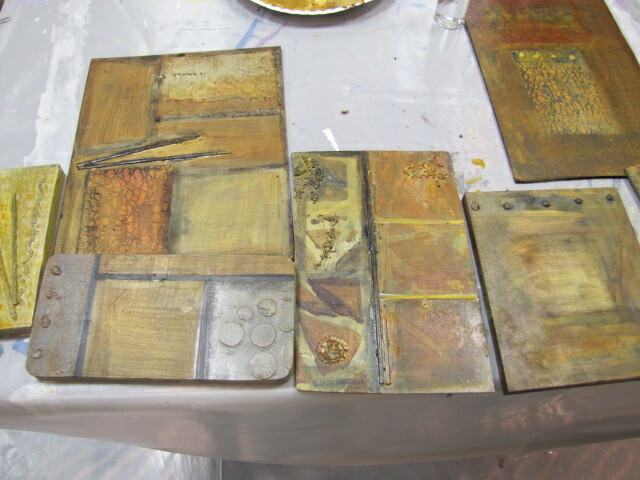 I love these kind of substrates to work on. The idea of the flexibility of it. My heart just skips a beat for this kind of art. My table mate was Marjie Kemper.. we laughed so hard and by the end of the day… well, lets just say frustration arose and a few swears were flying around. She made me do it… No, Marjie, I kid I kid… and I love ya. I have one picture of my scroll at the end of the day. 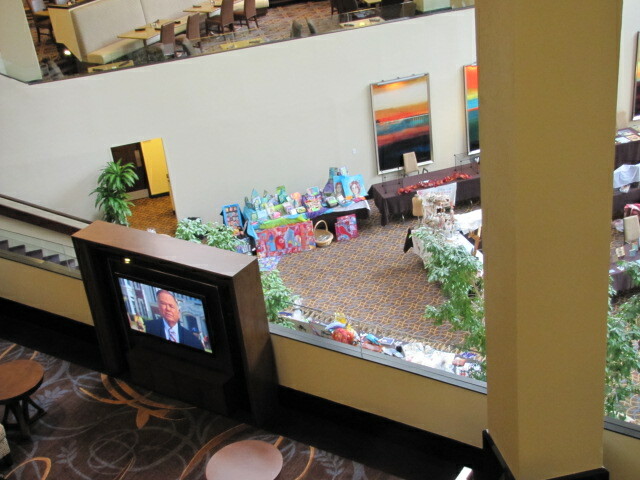 Our roomful of artists gathered around while we took pictures of our work. 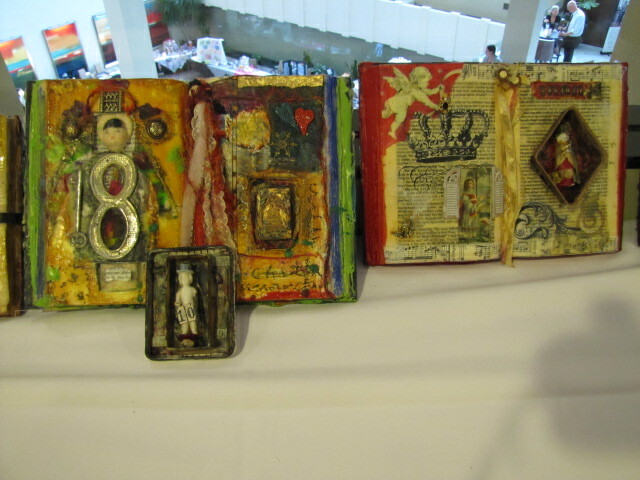 Mine is on the left and a shot of some of the others… look at all of the incredible art. 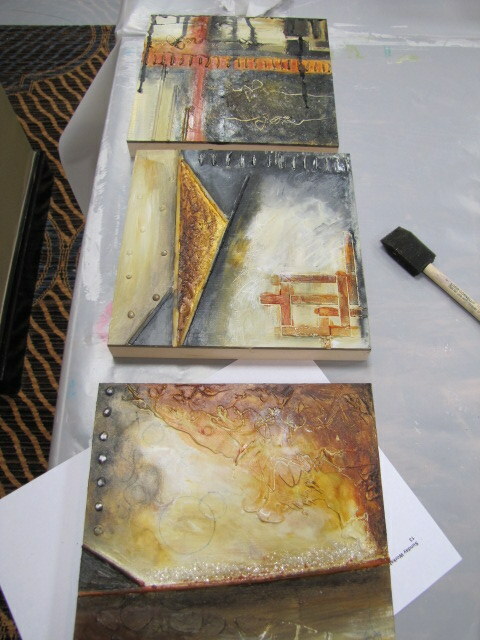 Now, you may look at my two art pieces and think they are complete, but they are not. There is much more shading I want to do here and possibly add more texture.. Who me? More texture? Ahhh.. ya. Andrea made it a point to tell us that to create these kind of pieces like this in a day, or in our cases… only 6 hours, is incredible. So, it’s almost impossible to finish it the way you want. 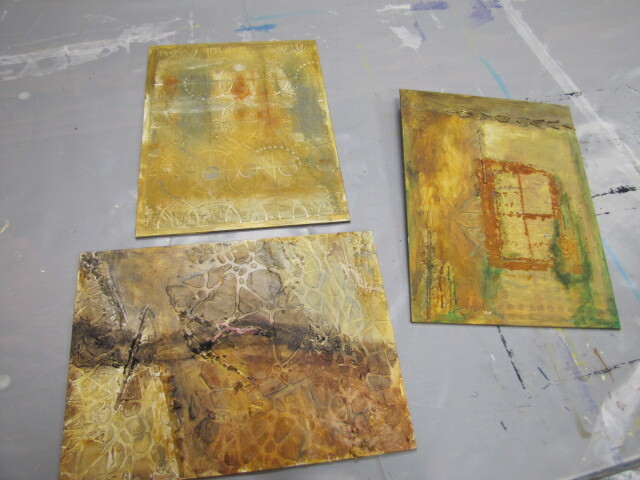 I am so proud of the art that I did and I learned so much from two amazing teachers. Truly. I hope you consider going to an art retreat. I have never been to any other, but I hear this one is the best. 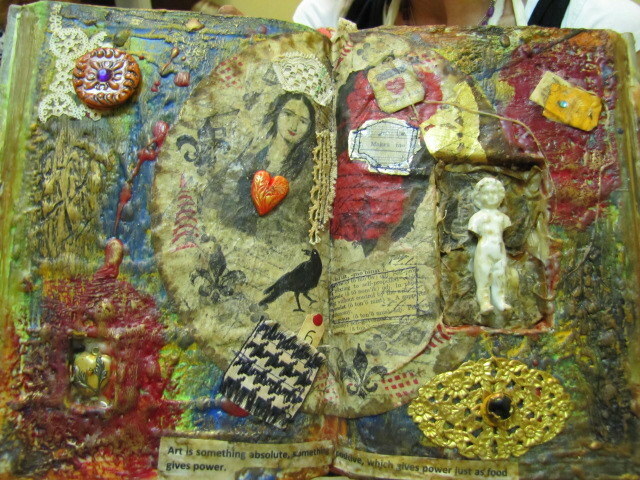 There is so much to write about with Art is You. We are all there for the same reason. To learn, to laugh, to play, to gather with our tribes and enjoy each other’s company…it’s a community. Not a place to judge or be judged. 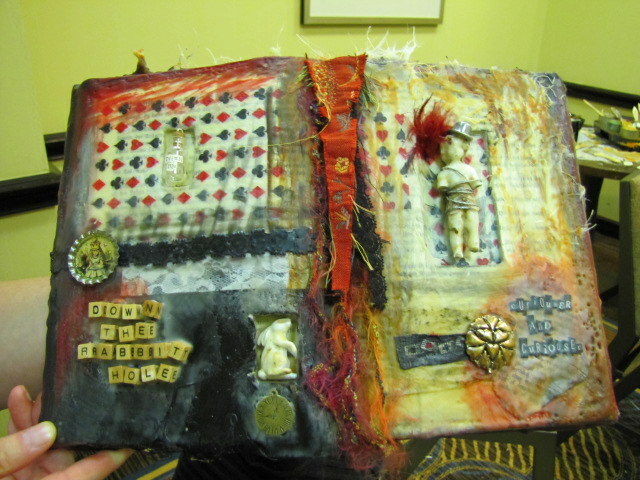 Sallianne and Ellen have managed to create a place like this that exists at Art is You. Stay tuned for a couple of giveaways and an upcoming blog hop. I guess I should unpack my art bag now… ugh. Thanks for stopping by and love to hear from you. Video time. I don’t need to say much here. I’ll let the video speak for itself. 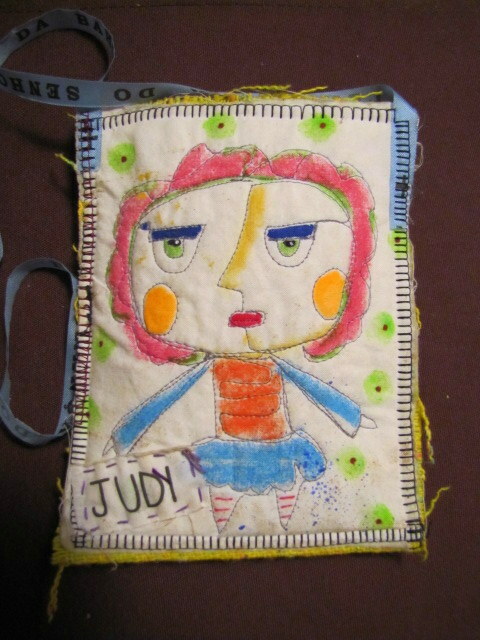 Art is YOU…Me… and We! I’m back from Art is You. What a fun time. As you know, this was my first art retreat. First ever.. and I went alone. Yup, just me and my talking GPS who kept me company. C’mon, raise your hand if you think the GPS is awesome? Wow, one, two, three… see there are a lot of you out there. “Navigator” on my smartphone rocks! Love her. This is what we wore around our necks for the weekend. So fun. How could you not smile with that on you each day? Each morning, we were greeted with a wonderful breakfast buffet and the same at lunch. It really was a sense of community. You can read about Art is You and about Sallianne and Ellen, it’s creators, HERE. Thank you, ladies and anyone else involved in helping make the event a success. Let me start by saying that as soon as I met my roommate, Jessica, I knew we were a good fit. As soon as I walked in the room and saw that she had her journal pages and her art supplies all over the bed, I said, “ok.. now we’re talkin”. Miss you JS. Hey, we have the same initials.. that has to mean something, right? You can read Jessica’s blog post about AiY HERE. I love it. Ok Ok.. i’m getting to the fun stuff. 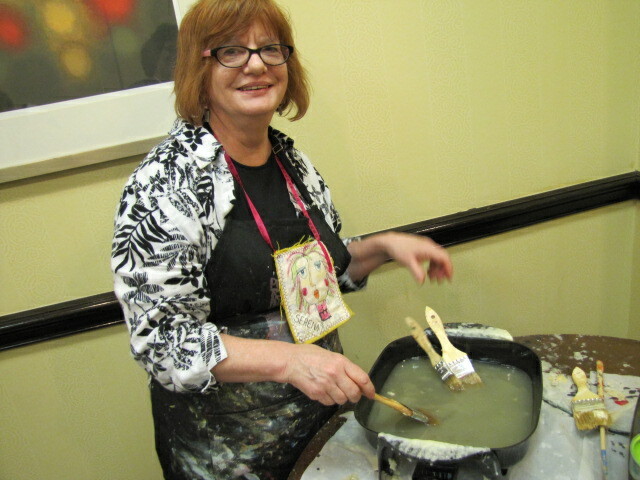 Saturday was a full day workshop with Serena Barton called Waxing Literacy with Charlotte. 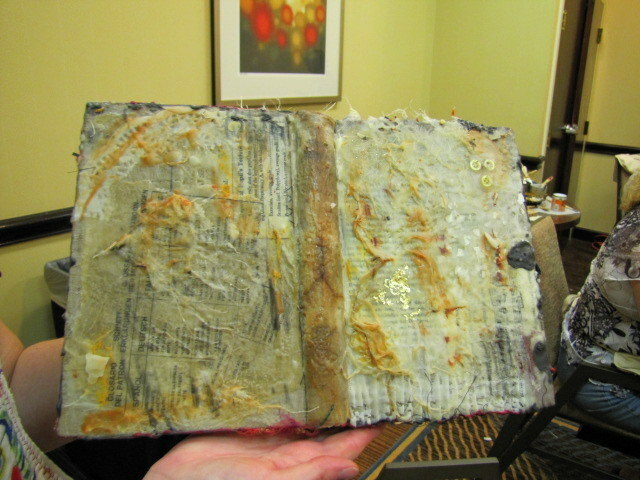 We took an old hard cover book and used encaustic wax, creating a display piece. Serena is such a great teacher and person. Hi Serena.. our wax queen! on right: this is the inside of Serena’s book.. anything look familiar to you.. on the left in the center…hmmmm? She used one of my ‘bellishments. 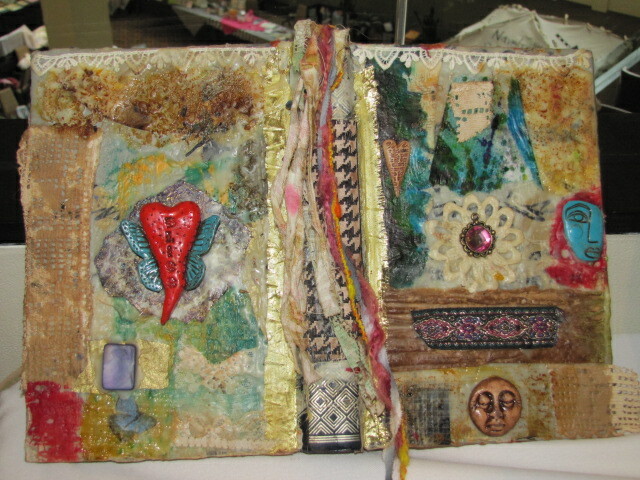 This is the inside and out side of my book. 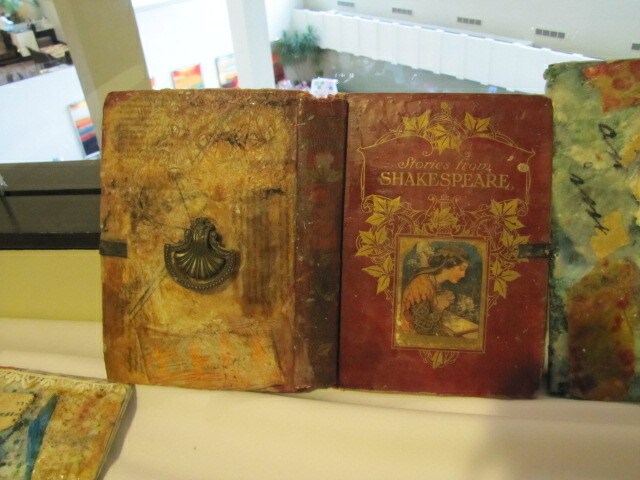 More books from the class…..
Far right: I love that Nancy used a small child’s book. Wasn’t that fun?? Thank you, Serena! Now, let’s move on the Sunday’s workshop with Mary Beth Shaw. What can I say about Mary Beth? We’ve exchanged emails back and forth about meeting. She’s fun, outgoing and a great teacher; making classes fun… oh and she plays some great music in class. I’ve been wanting to meet MB and take one of her classes for about 2 years now and both were more than what I expected. Mary Beth’s class was called More is Less. What a journey that was. 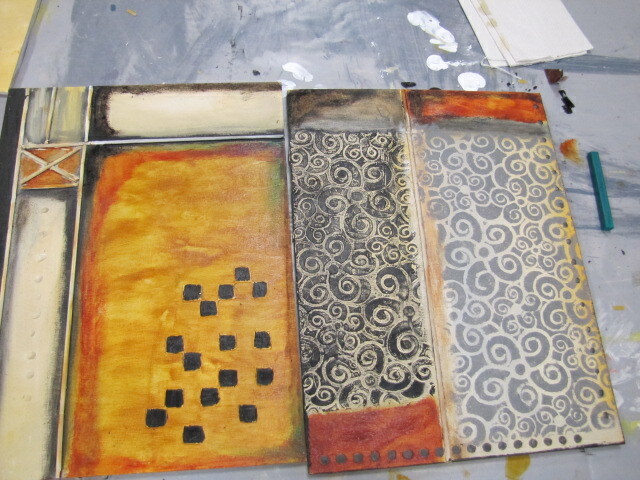 Making textures through stencils with paste.. my favorite thing to do. I wish I had brought smaller substrates. I worked too big and I think it was a bit overwhelming, to be honest. So, I finished two. Fair enough, let’s compromise. 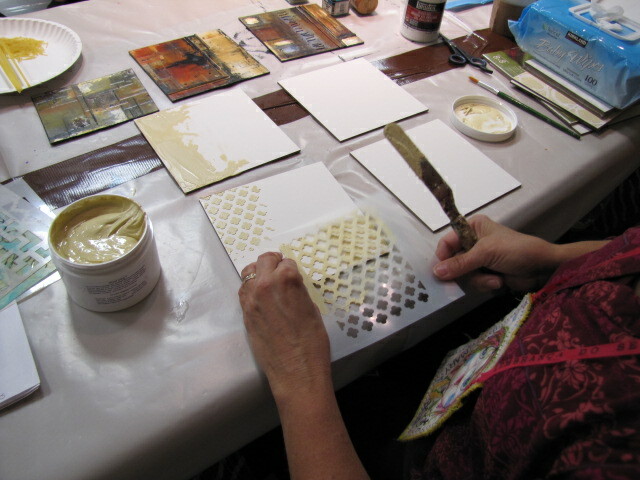 Mary Beth gave me permission to take pictures of her demo. Here’s a peek. Yummy Wood Icing and pasta, yes pasta! 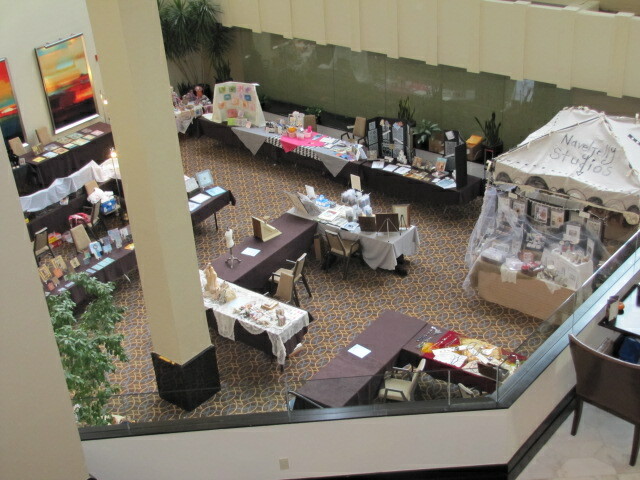 … and some of the rest…. 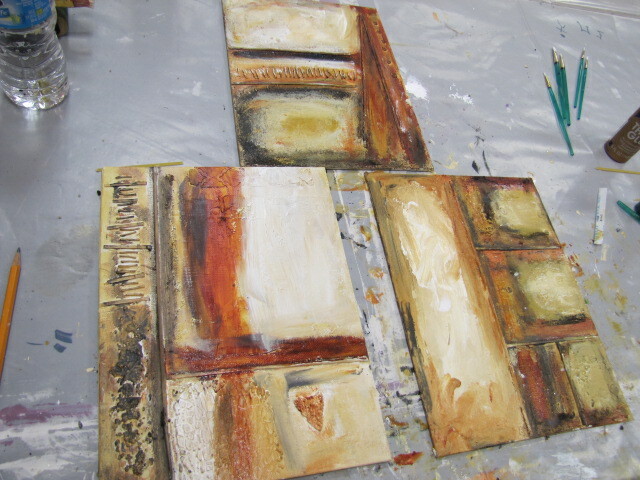 ..and here are Mary Beth’s 6″x6 boards… beautiful. So, there you have it.. my two classes. Two full days and nights of just fun and camaraderie. 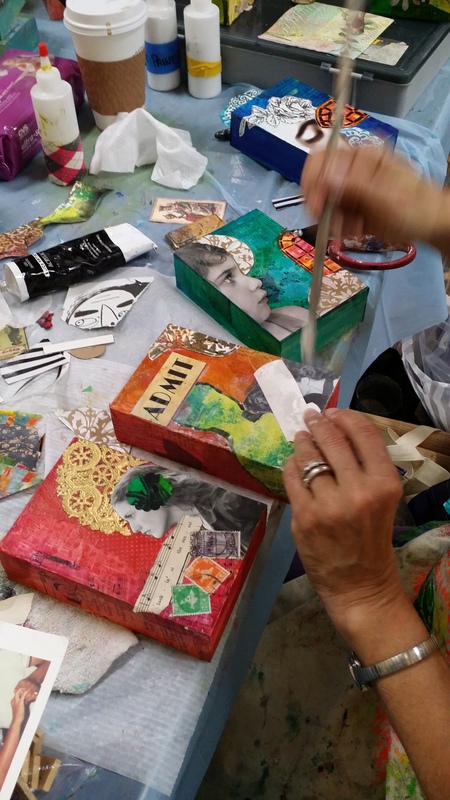 I made new friends and I was able to meet new artists in the mixed media world and say hello to the ones I have taken classes from before. 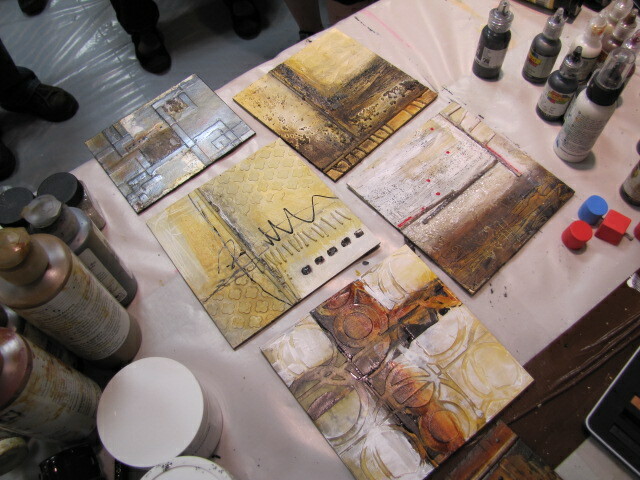 The ladies in my classes were so talented and fun to be with. Just imagine being in a place where we all think about art the same, all want to learn and share. What else could you want? I plan on keeping in touch with many of my new friends (you know who you are). ..and… can I just say that I need a full body massage now? Thanks for joining me in this art journey and stopping by. I love hearing from you.